Summary : Do you like mint in your teas? How about lemon? Well...if you answered yes to both questions then you'll most definitely enjoy this nicely flavored herbal tea from the Dragonwater Tea Company (now out of business). Review : I'm in the mood for mint. I've actually been craving it for nearly a week now, but other teas that I wanted to review simply kept getting the way. Argh! But alas, today at long last, I broke down and felt absolutely compelled to satisfy my inner-self and sweet-tooth by having a mint tea on this snowy Sunday afternoon. And the first mint tea to show itself was the Mountain Mint Tea from the Dragonwater Tea Company (now out of business), which is a organic herbal tea. This tea has a very powerful aroma indeed. And that aroma is of MINT. Hurray! And when you see the ingredients of the tea, you'll understand why the tea has such a aromatic punch to it. 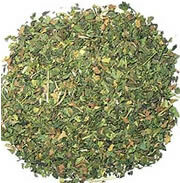 The Mountain Mint Organic Tea from Dragonwater Tea Company (now out of business) contains the following ingredients : organic spearmint leaves, organic peppermint leaves. The leaves for this mint tea are grown, like most other spearmint and peppermint is, in the Pacific Northwest of the USA. Indeed, it is possible that these leaves were grown right down the road from where I used to live in the Flathead Valley of Montana...mint was one of the largest crops in that area. But precisely where the leaves are grown really isn't that important. Instead...it's all about the flavor! Because at the end of the day, that is all that counts. And most happily of all, the flavor of this matches this teas lovely aroma. The tea is a perfect blend of peppermint and spearmint...with no one flavor dominating the other...always a risk with blended spearmint and peppermint tea. As this is a herbal tea, the tea is caffeine free and can not be overbrewed. So no worries about bitterness or repugnant after-tastes. Overall...if you are a mint junkie like I am...you MUST try this tea from the Dragonwater Tea Company (now out of business). The tea is simply a mint lovers delight. And if you love peppermint, or if you love spearmint...or better yet both...then this tea is almost certainly sure to please. Recommendation : Absolutely. This mountain mint tea, which is a blend of peppermint and spearmint leaves, is absolutely perfect. If you love mint teas, head on over to the Dragonwater Tea Company (now out of business)and pick some up. You will not be disappointed! Brewing Instructions : Use one-two tablespoons of tea leaves. Pour 1 cup (5.5 ounces, but 6 works quite nicely) boiling water over the leaves. Let the tea brew for 5-10 minutes. 7.5 minutes brewing time was used for this tea review. Tulsi Teas Original Herbal Tea : A very healthy and unique herbal tea with kind of a odd flavor and unpleasant aroma.